Oh my, it’s so hard to keep up a blog when you are too busy having fun. And fun is just what we were having the past few weeks. Many have been making their exodus’ from Boot Key Harbor, some have return home, others have taken their only home to its next destination, so we were blessed to have several farewell get togethers with many new friends. We all said goodbye to Dockside on this night, as they closed the doors for good a few days later. Fiddle Rock was great and all had fun, especially Rolland and Leta. This cute birdie stopped to give up some kisses to me. Then it was time with these cuties! Just for my Birthday and Easter, our daughter and son-in-law, Ashley and Ron and two of our grandchildren, Austin and Kiera, came to stay a few days. After we went snorkeling at Sombrero Reef, they made steak, baked potatoes and broccoli for my birthday dinner, all my favorites! BB from S/V Island Fever baked a loaf of lemon cake too, mmmm, so good! And the day ended with a little Birthday celebration at our boat. We went to Key West, and stopped on Big Pine to see the Key Deer. Havana Jacks to hear Ty and Cory and relax on the comfy couches and chairs. We think our son-in-law could be Cory’s brother. What do you think? We also did some fishing and the kids took the catch home to enjoy. Yea! They like it. On our last morning the kids participated in the Easter egg hunt the Marina staff out together. Thank you everyone, it was great fun. Our friends Gary and Debbie from S/V Aldeberon sold their boat, so we helped taxi things to shore before the new owners arrived to take possession. We are sad to see you go, but pray for safety in your next adventure. We had a a great evening at Lu Lu’s, we even got to hear Rolland sing and get his autograph! Kayaking in Boot Key is cool. We went with BB from S/V Island Fever and her son Justin, who was visiting from the cold north. The “trails” are amazing. And so was the company. Other fun things in the past few weeks was the Southern most Key West air show. Great talent and the Blue Angels made for a spectacular show. The company was great too, Mike and Lori from S/V Cheshire as was our pizza and salad at the no name Pub. This was an interesting demonstration of clean energy, I failed to get the back story, but thought the boat looked pretty interesting. If anyone knows about this, I’d love to know too! The Budweiser Clydesdale horses made a local appearance on their way south to the air show. Our friend Dan and his girl, Pam came a started a few days. We made another trip to Sombrero reef. I don’t s have a pic, but Dan found the best eggs and potatoes, with a slice of the best scrapple I’ve had in a very long. 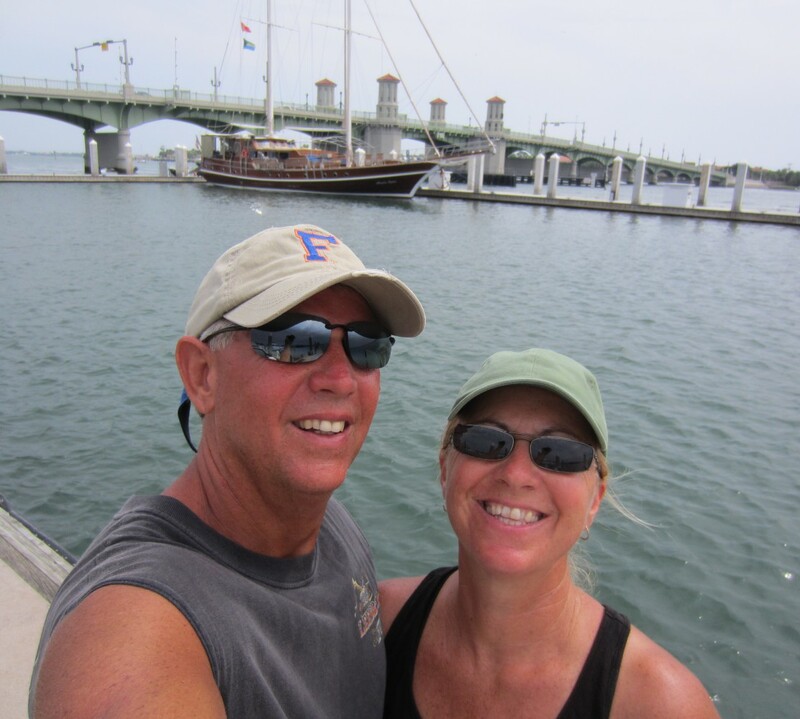 We finally made the boat ride out the Pigeon Key and had a great afternoon exploring the water off the dock. Unfortunately, that’s all we were able to do because they closed at 4. But we still had a great time hanging out the Dan and Pam and Ashton and Nina. We had another get together/dinner at Havanna Jack’s. With Ashton and Nina and Greg and Judy before they all left for points beyond. One last night out with the locals! Always good to hear Ty and Cory. We will miss their music and all the great friends we have made. And Burdine’s French fries. Ashton let us use his bike when he was gone and Nina challenged be to try the foot pegs. I did it and here’s proof. They do these things here, it’s called dinghy rafts and they just float through the water picking up those left behind or stranded. We caught one in progress. It turned out to be a lot of fun. Pepe is on a mission to prove curiosity killed the cat. We can not open anything up he wants to get inside. And just like that, four and a half months at Boot Key Harbor came to an end. We loved the people and all the activities, we hope to come back again soon. We had one last show from the dolphins as we left the harbor!!! We are heading to the Bahamas, stay tuned for all the new adventures to come. Thanks for following along with us. My five this month have to do with storage and making things weigh less. We hope to head to the Bahamas in the next few weeks and we will have to leave the mobile storage unit behind. Everything I think we need must live on the boat or we will do without it. #1 Taking more stuff off the boat. We have managed to reduce and thin out yet again. All this stuff in the back of the mobile storage unit is going home, but it isn’t enough, No Ka Oi has a sinking water line and as much as I think I am a minimalist, I fail miserably! #2 Vacuum bags. I have taken vacuum bags beyond collapsing clothes and bedding. I have bags of coffee in one, making it flat enough to slide behind the water tank and keeping them together so they don’t fall into any cracks. And how about this idea for toilet paper? Its working for me. That’s 24 rolls in that red bag and 18 in the blue one, waterproof and heading to the bilge. #4 I took my jeans off the boat because they are bulky and hard to wash by hand. But, I think I need at least a pair of long pants for the summer. These light-weight 100% cotton ones should do the trick. They dried on my makeshift cloths line in an hour and need no iron! #5 Primula Coffee Brew Buddy. I’m in love with this little guy and my coffee maker is going home. I am the only one who drinks joe on our yacht, so this is perfect for my one to two cup morning habit. $5.99 and a small pot of boiling water and it gains me more space. Here’s a link, Coffee Brew Buddy. I just purchased the basket and set it right on my Yeti cup and it works perfect. I’d still like to raise the water line, let me know your best ideas for lessening the weight. Well we left the Harbor to meet family and friends at Daytona’s 75th Annual Bike Week. We had a great time at the bike week part, unfortunately, anytime we head home there are problems to deal with! Let’s me share the problems first, so we can finish this blog up on a happy note! You might remember the tree that was struck by lightning last summer? Well it wasted no time dying and had to be taken down. This was not in the budget, but the dropping part was out of our skill set. We settled for having it dropped and cut into big pieces and we supplied the labor to cut it up the rest of the way and stack up for fire wood. For the record, our retirement hourly rate is $88.23. We aren’t discussing what the split on this rate is. Then there was the swimming pool. Not a good day when you come home and the pool is only half full! Fortunately, the pool guy had turned off the pump when he thought there might be a problem, so the Captain donned the only mask living at the house and put down a patch. We will get a bill later this month letting us know how this impacted the budget. I’m not sure how mixing up the vet appointment for the wrong day, turned into pressure washing the decks and driveways. We could have rested on that extra day, but not when you live with Captain Bligh! We ended our “week” home (actually ten days) by waiting for the vet to fill prescriptions for Nyah and Pepe, who apparently picked up a little something along the way. Meds all ingested, they are good to go. And so are we! We couldn’t have asked for nicer riding weather. BB and Howard came over and we took a nice ride to Lake Weir and then back to Daytona for dinner and a cruise down Main Street. We met up with Pete at Rossmeyers on Friday and enjoyed looking at the “big wheel” bag bikes competition. Damien and Julie came up and and we had a perfect ride on Saturday morning and Saturday night. We spent the day at Rossmeyers, the Daytona Speedway and Main Street. Fortunately, Julie was able to find a nice leather jacket and could throw this one I loaned her away, before the world was full of black flakes. Rick and Jennifer made a last minute trip up on Saturday and it was great hanging out and seeing them before they had to head back home. We are back at the boat making final preparations for heading to the Bahamas soon. It’s always nice when the locals come out to greet us. We are glad to be back in Boot Key, but what’s up with this temperature in the middle of March??? But we will take it as long as we keep getting these views. No Ka Oi has an additional radio aboard. After months of research and weighing of options, we took the plunge and invested in a single side band marine radio (SSB). Our main reasons for even considering adding more weight to our already sinking water line was to receive accurate and timely weather, as well as safety and personal communications abilities, when we are out of the country and do not have accessible wifi or oh one service. The Captain started the research by polling other cruisers and killing our cellular data plan. Our friend Addison on S/V Three Penny Opera, started out his recommendations with this insight. Doing nothing at all and relying on cell phone reception, VHF, word of mouth or wifi connections, because we did not have this item in our budget. We finally decided an SSB was the best option for us. One comment from Addision kept coming back into our conversations, “There is a lot to be said for dead reliable technology, even if it is over 100 years old.” We highly considered just getting the receiver, but we didn’t feel it was a good investment in the long run because we knew eventually we would need to communicate out and also add email capabilities in the future. We didn’t get the Pactor modem at this time for budget reasons and our adventure for the remainder of this year will regularly have is in places we can get wifi. We also heard there might be some options to hook our PC directly to the SSB if we purchase certain software, so we will be checking into that option. The parts trickled in. The SSB remote and the transceiver were on back order, but rather than wait for everything and have one big install, the Captain worked in stages. The GAM antenna arrived first and the Captain had it in place on the back stay in 30 to 40 minutes. He snapped it onto the stay and slid it up into place. The wifi antenna had to be removed and ended up just a bit lower after the GAM was in place, but seems to be working fine. This was an easy install and we didn’t have to cut the stay to add ? like some antenna options require. Next, he installed the DSC antenna he picked up for $15 from a friend who had never installed it on his boat. Finding a place on our already full transom and a trip to Home Depot for a couple of SS screws and nuts, was the hardest part of this install. This is the one component we hope is never actually used. The automatic antenna tuner was not on back order, so the GPS store shipped that ahead of the other pieces. This was installed in the inside of the transom in our rear locker. A few days later, we received notification that the antenna coax arrived. While I went ashore to retrieve them, the Captain emptied lockers so he could crawl into the bilge to run them from the tuner box to the navigation station. When we opened the box, we had one white wire and one black. They should have been the same. Upon inspection, the white wire’s package was labeled LMR 400, but the imprint on the cable was SI 400. So much for Amazon orders! We contacted the manufacture, MDI Digital, and they shipped us two new cables, with a discount. They were on a truck within an hour. We returned our Amazon order, and put the boat back together until the correct cables arrived. Installation of cables was finally completed, with the Captain being a Houdini. Finally the SSB and transceiver arrived and the final connections were made. Nice job Captain. Pepe is a true ships cat, maybe a former plant operator in one of his nine lives. He performed all necessary walk downs and hung all the clearances. Success! We tested our reception early the next morning by listening to a Chris Parker broadcast. We could hear anyone he was talking to who was Northeast of the radio towers to the East of us in the harbor, those towers cause all kinds of issues. The Captain applied for the necessary FCC licenses online and we received them in a few days. After programming our MMI numbers into the radio, we were good to transmit. We had clear conversations with two different vessels in the harbor, and we feel comfortable that we have added a layer of safety to our adventure. If you have information on the SSB email options without using a Pactor modem, I’d love to hear about it. Better weather has finally settled in and we are taking advantage and getting out and about to enjoy Marathon and Boot Key Harbor. Everyone else seems to be doing the same, the dinghy dock has been filled to capacity. We had a fun evening at Burdines enjoying the music of Ty and Cory. Our front row seats at the groupie table were perfect and the company was great too. Thanks so much Marsha for letting us crash your table after we were too late to get a seat with Lori and Mike! Georgette and Gary had to leave to go work at Turkey Point for a couple of months, before they begin their Great Loop adventure. We have had a great time getting to know these two better, we met last summer in Marineland and clicked immediately when we learned they are nuke workers like us. A great part of our adventure is all the great new people we have met and the wonderful friendships we are making. If you find a small trail in the mangroves, on the west side of Sister’s Creek, near a rope swing, you should definitely spend a few hours hiking the old roads on Boot Key. We had a lot of fun exploring and the harbor view from the bridge is awesome. The Captain was car shopping, I didn’t let him get one though. Full moon over the harbor. No wind + no rain = a great view. Nyah was not impressed by talking tug boat at the nautical flea market, she certainly felt the need to protect us from it. Our SSB radio arrived in bits and pieces and the Captain was a real trooper to run wires up the stay, down the bilge and everywhere in between! Next up licensing and learning to use it. Blog post to follow. After all that contorting, I convinced the Captain that he could do yoga…doesn’t he look so relaxed! Lunch at La Meditarrenee Restaurant. This gyro was excellent as was the service. We also had dinner here before Georgette and Gary departed, they make an awesome shrimp parm!!! It’s all fun and games when someone leaves a line hanging around. Pepe thinks a sailboat is cat’s heaven. Well, that’s the news from Boot Key. We hope you are doing well and would love for you to come visit us here in paradise. Sunsets for free.